ApniTally is providing Diwali gift to its readers. Till date many readers of ApniTally has contacted me for Tally software or a crack for it. I have tried to provide them download of Latest versions. But they were all educational version i.e. with date restrictions. 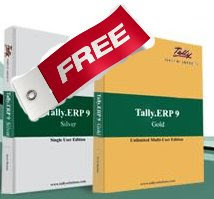 But now who ever wants can get a licensed copy of Tally.ERP 9 and that too Free of Cost. You would get the Unlimited User Gold version for your network. if you have computers to install. This should be considered as promotion of Tally as well as ApniTally. So if you were willing to buy Tally but want to use it with full features for some time before actual purchase or just want to learn Tally for some time then this promotion is for you. The process is simple. No quizzes, no slogans just simple download. First download the latest version of Tally.ERP9 from here or here and install it. Now download Cross Loop software and install it. After you do that just give a mail and i will activate your copy of Tally.ERP 9. Further more if you need some tutorials related to implementation or how to do list then i can mail CD of Tally Tutorials which i have compiled from different sources. I would charge Rs. 450/- as handling charge for this. I am planning to activate most licenses on Sunday. After that i will send the time on mail to individual person. There is no catch in this you need not to spend a single penny in this. Only catch what so ever is that this Tally would work for 3 months only. But if you need not to pay a single penny and still enjoy full version for 3 months then its not a bad deal. After the license period is over and you still want to use it for some more time then you can pay accordingly and Buy it on rent for 3 months and so on. Does the tally tutorials CD also contain tally tutorial for TDL file development? This book is useful for enduser, Chartered Accountants, and Computer training centers. We are a taxi company Hummingbird Cars in London. We provide Airport Transfer service from all london airports. We are new in the business and we require to buy a good accounting software. Can anyone please advice which software will be suitable for us as we are a small business and also which one will be relaiable and affordable. hi alex, Tally is complying all statutory requirements of England. You can use it for 3 months and see if you can do your business or not. If you have special requirements then you can let me know, we can discuss. I had dowloaded tally new verson from tally web site and also installed both cross loop & tally but i coudn't send a mail to you as there is no mail id of your's and the link send me a mail is not working, so please tell me what should i do for activating my tally and also i am intrested in getting tutorial from you so please tell me procedure how to get it from u. My email ID mvshah54@yahoo.com. Please make it friendly to contect you. When you are in a helping mood, do not make others as bagger. Mustaf, On top right hand corner there is a link send me a mail. Click on it and send me the mail. Should I give you the same email address that I have used to download Cross Loop or a different one ? I AM IN SEARCHING OF TDL DEVELOPERS FOR OUR CONSULTING FIRM. I hv dowloaded tally new version from ur web site and also installed both cross loop & tally but i coudn't send a mail to you as there is no mail id of your's and the link "send me a mail" is not working, so please tell me what should i do for activating my tally.